Integrated products & services pages in an easy-to-navigate way. Sticky button on lower right of site informs visitors of special deals. Testimonials page allows customers to rate and review Devenu. Before & After sliders help show patient transformations. E-commerce & gift card setup. 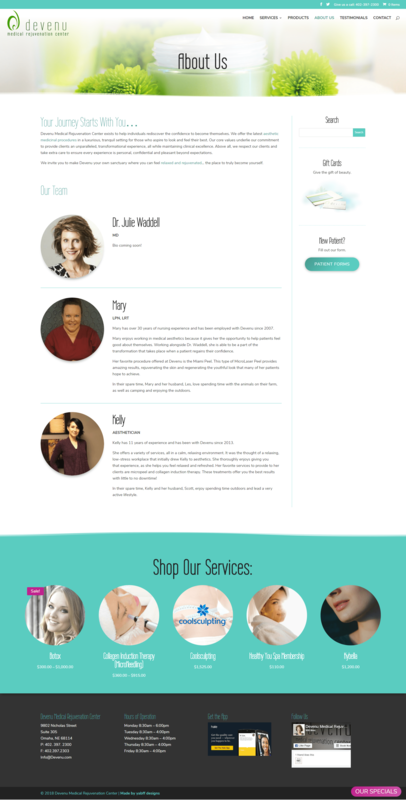 Devenu Medical Rejuvenation Center has a large number of services they offer their patients, and they wanted to be able to offer a portion of these services for purchase online, but didn’t want to have these services duplicated as both pages and products. To accomplish this, we custom-built both product pages and regular pages to have a complimentary appearance and style, and removed the default “shop” page in favor of two fully-integrated service category pages which make it easy for patients to browse the site. We also created a sticky button for the lower right corner of the site, which doesn’t move while scrolling and helps draw attention to the Specials page, where current deals and packages are offered. The testimonials page allows Devenu patients to rate and review their experience with Devenu, and helps the Center show off their reputation and trustworthiness to potential patients.